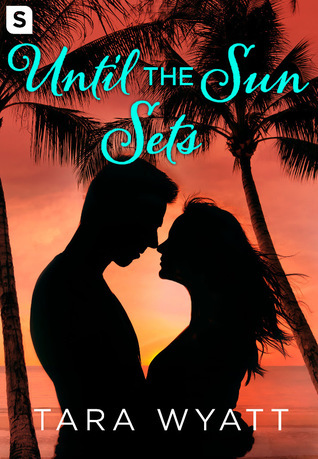 Two best friends at a destination wedding in Mexico are forced into a fake relationship; but when one kiss turns into a week-long fling, could this change everything? Dean Grayson doesn't do commitment. So when his cousin asks Dean to bring a date to his wedding in Mexico, he asks his best friend, Carly Jensen, to come with him. After a recent break up, Carly’s feeling like she’ll never find love, so a week in Mexico with her best friend-slash-boss is the perfect way to take her mind off things. As fate would have it, Carly’s ex is also a guest at the wedding…with his new girlfriend. To protect her pride, Carly and Dean decide to fake a relationship for the week. But between the sand, surf, and sharing a bed, these friends turned lovers realize they’re meant for something more. I’d never heard of Wyatt’s books until a blogger recently bought Until the Sun Sets to my attention. Fake relationships that develop into something more deep and meaningful have always been a favourite trope of mine. More so when done well and Wyatt did an incredible job of Carly and Dean’s relationship, I’m shocked as this book was only over a 100 pages, but the chemistry coming off these pages had me completely swooning. Dean has the reputation of being a player, so much that his cousin suggests that he brings a date to his wedding, as he doesn’t want Dean sleeping around with all the single women and breaking their hearts. Dean has no real options, so asks his co-worker and good friend Carly to accompany him. Both had planned to attend as friends, but things started shifting slowly on the plane journey over, but also when Carly’s ex was at the same wedding, and she didn’t want to come across as lonely individual so told him her and Dean were dating. Here’s when the fake relationship begins and honestly I assumed that these two would just have a great time pretending to be a fake couple and then eventually go back to how they were when they went back home. But both ended up getting something way more than either could have imagined, what started off as just two friends occasionally holding hands turned into innocently rubbing suntan lotion on each other, to some of the hottest scenes *fans self*. I of course was eager for these two to realise that what they had both discovered was something a lot of people spent years searching for and it was right in front of them. But of course I also knew that someone would try and sweep what has developed under the carpet like it was nothing (why does this always have to happen?). However this minor irk aside Wyatt did an incredible job with this short story, so much that I was left wanting a full story from these characters straight away. If you’re in the mood for a hot summer read with chemistry off the charts, then this is definitely the book for you! I haven't heard of this author, but you know I love a good second chance romance. This one sounds like the perfect summery read for sure. Glad you enjoyed this, Jasprit! Oh fake relationship is a favorite trope of mine!! Thanks for putting this one on my radar. Great review! Ahh...the familiar fake couple to lovers trope. It is always fun. Glad you enjoyed this one despite your minor problem. Oooh, I love fake relationships and this author is new to me but I definitely need to check this one out! I love fake-relationship stories, and I haven’t heard about this book before. I’ll definitely check it out.